The Double Star quilt block is comprised of two star units -- one star inside the other. 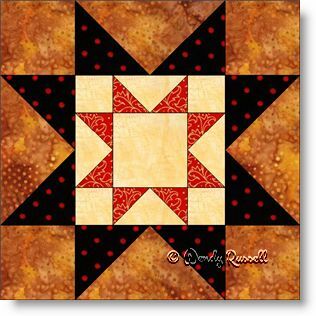 The stars are each a Sawtooth Star which is a popular quilt block all on its own. This block takes the Sawtooth Star to a new level. The Double Star is comprised of lots of flying geese units and could be considered an intermediate level quilt block due to the number and size of the individual pieces. However, by taking care with sewing an accurate quarter inch seam allowance, this quilt block will be together in no time.